Diorama (and the Warzone Map Tools) are licensed under the GPL 3 and are © 2009 by Florian Schanda and Martin Brain. When starting diorama you should be presented with a screen similar to image shown on the right. Go on, click the Bake! button to create your first random map. This should create a random 2 player map given all the properties listed above the bake button. Hint: You should start diorama from a terminal (such as xterm or konsole) as a lot of useful information and diagnostics is printed while the program is baking. After a while your random map should appear in the map preview to the right. The lighter shades indicate higher terrain, darker shades indicate lower terrain. Red indicates impassable cliff tiles. Blue indicates lakes (the map shown in the screen shot does not have any lakes). Light lines and squares represent both a player's structures or walls and also neutral structures (abandoned buildings) or features (such as trees or rocks). Darker lines indicate roads or tracks. Lighter squares indicate buildings (both neutral and players) and other terrain features (such as rocks or trees). Light green dots represent oil resources. The dark band around the edges represents the annoying 3 tile map border on which you cannot place any buildings. The map shown in the screen shot has two player bases (top left and bottom right) and also has a total of 6 oil wells scattered on the map (in clusters of two each). If you click the Save button, then the currently shown map is saved in your ~/.warzone-2.2/ directory. Its name will be whatever is entered into the Name text field, with the usual 2c-, 4c- or 8c- prefix. You can now play this map in skirmish (and multi-player if you give it to other people as well). This section will describe all the parameters you can fiddle with to give you a variety of maps. Name given to the map once you click the Save button. Output a map in the specified format. 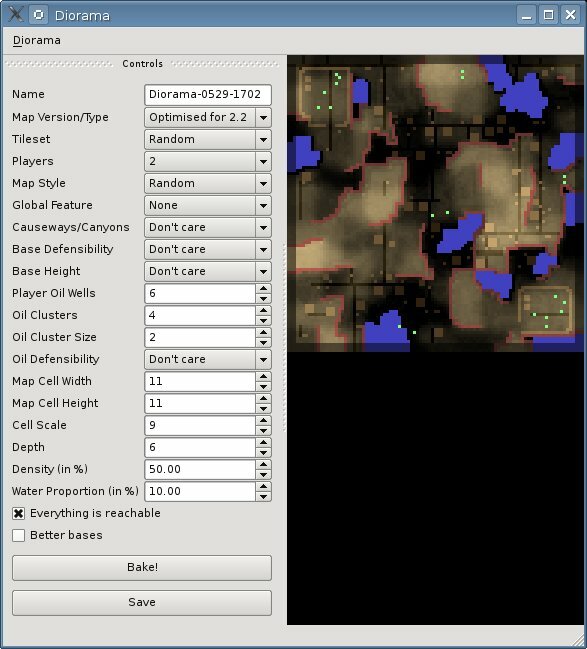 Optimised for 2.2 - Create maps for both warzone 2.2 and trunk. Currently trunk will not render roads, so if you want to play in trunk you should choose trunk here. Trunk only - Create maps optimised for trunk. These maps will be more or less unplayable in 2.2, but should look much better on trunk. For now this option will not generate urban maps for random tilesets (as they look a bit crap) and it will also not create any roads (as trunk won't be able to display them). This option influences two things: The actual tileset (Arizona, Urban or Rockies) and what kind of features are placed on the map. Arizona - Draw roads between interesting points on the map. Place a small number of derelict towns somewhere near a road. Urban - Draw a grid of roads all over the place. 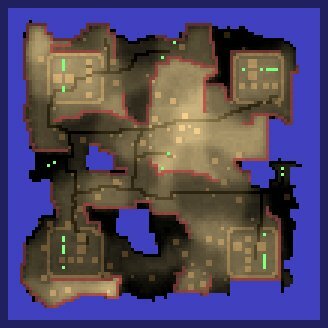 Place derelict buildings on most tiles (except the highest regions of the map). Place cars and other features on or near roads. Rockies - Draw roads between interesting points on the map (same as with Arizona). Draw a few huts anywhere near roads. Place a number of trees randomly on the map. Number of player bases to create. It is often faster to create good 8 player maps with the Map Style option set to Symmetry. Due to limitations of warzone this can be only 2, 4 or 8, however there is no intrinsic limit in Diorama on the number of player bases generated. This option influences the overall map generation approach. Random - This generates asymmetric maps. For maps larger than 12x12 this can be very slow. Symmetrical - This requires the Map Cell Width and Map Cell Height to be equal, and will create a much larger map by mirroring it on both the X and Y axis. The total size of the map is equal to 2*size - 1. However note that 8 player maps created with the Symmetrical option will not be truly symmetrical: In order to satisfy Base Defensibility constraints the solver will alter the terrain around the middle (non-corner) bases. Also note that oil cluster placement is not necessary symmetrical on Symmetrical maps - but there is a very good chance it will be. A global feature is a special constraint on the map which will significantly influence the style of the map. Setting this value to None results in a map that is completely random, as no special constraint is imposed. Each availible global feature is described below, with an example map to illustrate it. Most of these options work with the Symmetry map style, for one exception: 8 player, symmetrical hotspot maps are not yet possible. Hotspot - This will enforce a cross of "walls" through the map, leaving a gap in the middle. Wasteland - This will cause next to no cliffs to appear in the middle of the map. Lake - This will create a large body of water in the middle of the map. Continent - This will enclose the entire map in water, effectively giving you a continent (or maybe a large island). A causeway is defined as a (small or large) section of terrain which is higher than two surrounding areas (on opposite sides). A canyon is the exact reverse. Don't care - This option will not impose any constraints on the numbers of causeways or canyons; you may get some or you may not. Few - This will severely limit the number of causeways or canyons, generally resulting in a more open map. Lots - This will enforce a large number of causeways or canyons. Note that for some values of the Density option (very high and very low), constraining this feature will significantly increase runtime. If set, this will cause each player bases to be surrounded by exactly 0, 1, 2 or 3 cliff fronts. If set this will cause each player base to be higher or lower than surrounding terrain. This defines the number of oil clusters randomly strewn onto the map. Within their constraints (see Oil Defensibility), they are placed on the map such that their distance between each other and to any player base is maximal (i.e. equally spaced from everything). If more than one such placement exists, then one is chosen randomly. For technical reasons this option must be at least 1; if you want to disable any non-player-base oil, then set the Oil Cluster Size option below to zero. Each oil cluster will have this many oil wells. The total number of oil wells not intrinsically associated with any player on any map is Oil Clusters * Oil Cluster Size. Similar to Base Defensibility this will cause oil wells to be placed near cliffs (or in alcoves). The Cell Scale option influences the detail of the map created. Larger values give you a larger but more bland map, smaller values will result in a more intricate map. The Map Cell Width and Map Cell Height options simply increase the size of the map, but increasing the number of cells. An eight player map requires at least 100 cells, otherwise the layout solver will be unable to place all bases and the grid solver will be unable to create any terrain. If you want to play a game with full bases, you will get much better results if Cell Scale has a value of greater than or equal to 10. This option defines how many separate height levels exist. Warzone only has 256 distinct height levels, which are portioned up into Depth values. For example a map generated with Depth set to 3 will have terrain at heights 0, 128 and 255. A consequence of this is that maps with lower Depth will have much more pronounced cliff sides than maps with higher Depth. This option constrains the number of cliffs that should appear in the map. Lower values give more open maps with undulating terrain, higher values give intricate maze like maps. This option is the ratio of water to land. Note that high values significantly increase runtime. This option ensures that there are no sections of the map which can only be reached via VTOL or hover. Note that even if this option is not set, there will always be a walk-able route from any player base to any oil well cluster and to any other player base. If this option is set you may get empty islands or mountains that do not have a ramp. Not set - This will use a quick and dirty way to create player bases. Due to the algorithm sucking, no further structures are created. Set - This will create complete player bases. On top of the above listed the following structures are created: Two vehicle factories and two research facilities. It is recommended to set Cell Scale to at least 10 if you intend to play a game with full bases, as otherwise all bases will be extremely cramped. The only reason this option is turned off by default is that currently it can significantly increase the time it takes to create a map.